Wren (Troglodytes troglodytes). Taken at Otmoor, Oxon., on April 13th 2017. Taken at Otmoor, Oxon., on April 13th 2017. The Wren is a tiny brown bird. It has a dumpy, almost rounded body, with a fine bill, quite long legs and toes, very short round wings and a short, narrow tail which is sometimes cocked up vertically. For such a small bird it has a remarkably loud voice. It can be found throughout the British Isles. It breeds in woodland with dense undergrowth, in overgrown clearings and scrub, also on barren islands with hedges, shrubbery, walls, etc. 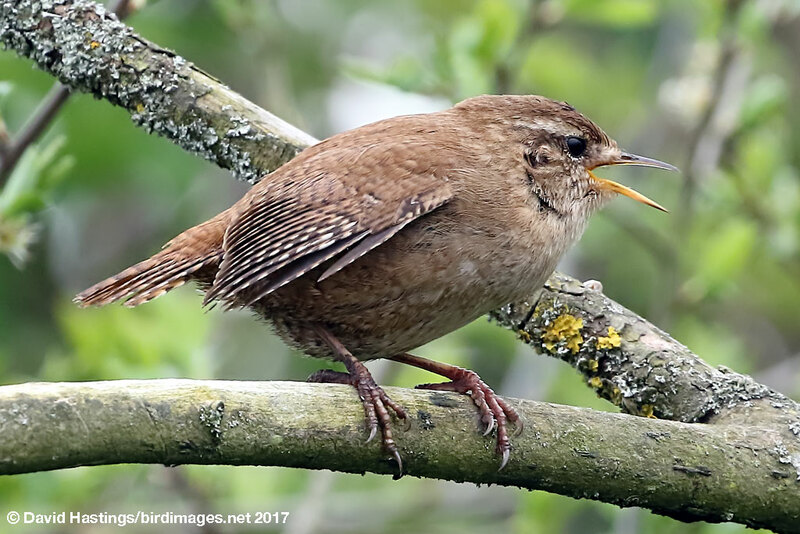 Wrens spend much of their time hidden in undergrowth, but their loud song gives them away. There are around 8.5 million breeding territories, making it the commonest British breeding bird.